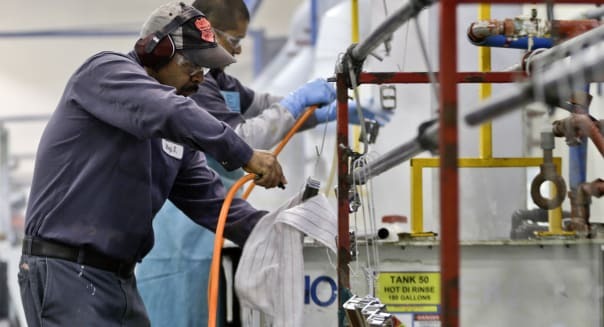 WASHINGTON -- The U.S. economy rebounded more strongly than initially thought in the second quarter with a bigger chunk of the growth driven by domestic demand in a bright sign for the future. Gross domestic product expanded at a 4.2 percent annual rate instead of the previously reported 4 percent pace, the Commerce Department said Thursday. Both business spending and exports were revised higher, while a buildup in business inventories was smaller than previously estimated -- a mix of growth that provides a stronger underpinning for the remainder of the year. %VIRTUAL-pullquote-The economy is in good shape and getting better.%Separate reports showing a second straight weekly decline in the number of Americans filing new claims for jobless benefits and a jump in home purchase contracts also suggested underlying momentum in the economy. "The economy is in good shape and getting better," said Joel Naroff, chief economist at Naroff Economic Advisers in Holland, Pennsylvania. One report Thursday showed the number of Americans filing new applications for jobless benefits slipped 1,000 to a seasonally adjusted 298,000 last week. Growth in the second quarter was broad-based, with consumer and business spending, exports, homebuilding and even government contributing. Domestic demand rose at its fastest pace in four years, pointing to a recovery that was becoming more durable after the first-quarter's weather-induced slump. Still, the data was unlikely to lead the Federal Reserve to bring forward the timing of interest rates hikes as slack still exists in the labor market and inflation will likely remain below the U.S. central bank's 2 percent target. "We still have a long way to go. Hence, the Fed remains cautious about how rapidly it will raise rates when they start," said Diane Swonk, chief economist at Mesirow Financial in Chicago. While first-quarter growth in household disposable income was revised down, the second quarter estimate was more robust than previously reported -- a good omen for future spending.